YZS-68 screw oil expeller is a small oil press that can extract oil from various oil seeds and nuts, such as cotton seeds, soybean seeds, peanut kernels, rapeseeds and so on. This mini oil press has successfully passed IS09001: 2000 certification for environmental protection and quality management systems and is CE certified. Known for its small size, easy operation, continuous 24/7 use, and high levels of productivity in producing large quantities of 100% vegetable oil, the YZS-68 small oil making machine enjoys popularity in the global oil extracting market. We specialize in creating custom built configurations that will get you the maximum amount of oil and meal from your seeds! Welcome to email us in form at the bottom of the page! 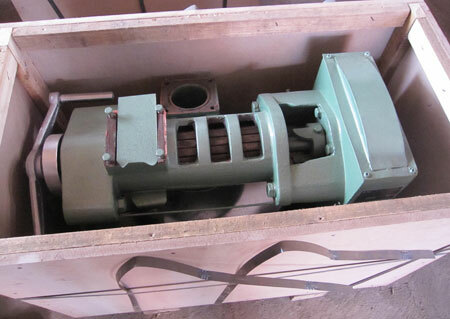 The main structure of the small oil machine is composed by one piece of worm shaft and several pieces of screw rings. 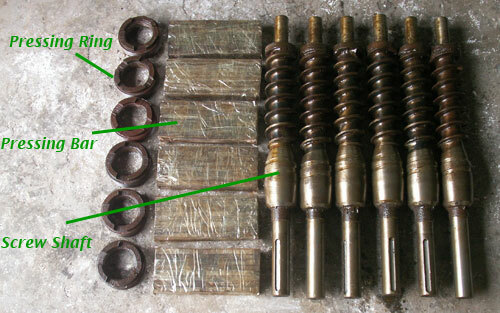 Below is a general picture of its spare parts. ★ Compact structure, easy operation and less maintenance. ★ Widely used in processing various seeds and nuts. ★ Cast iron machine base. ★ Average rotating speed with the special gear box. Cottonseed meal is a good source of protein. It is the byproduct remaining after cotton is ginned and the seeds crushed and the oil extracted. The remaining meal is usually used for animal feed and in organic fertilizers. Most of the meal is extracted mechanically through cottonseed kernels. The flaked cottonseed kernels are put into high pressure through a screw inside a barrel which is constantly revolving. The screw pushes out the oil through the openings made in the barrel. The dry pieces left in the barrel are preserved and ground into meal. Cotton seed meal can be used in multiple ways: either alone or by mixing it with other plant and animal protein sources.